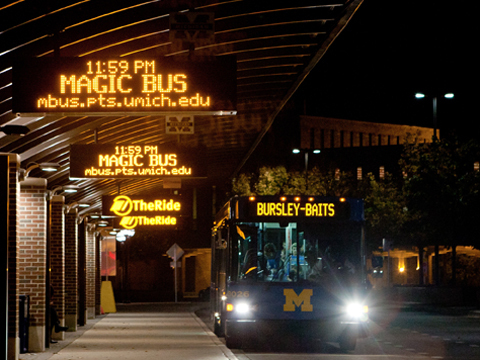 Check out the Magic Bus for real-time University bus updates. Ann Arbor Transportation Authority or AATA bus rides are free if you swipe your Mcard; otherwise regular fare is $1.50. Passes are available at the downtown AATA Blake Transit Center and online. Check bus routes and schedules. Visit the Logistics, Transportation & Parking website for information on all campus buses. Central Campus << -- >> North Campus: Take either Northwood, Bursley-Baits, Diag to Diag, or the Commuter North and Commuter South buses. Central Campus: The Oxford Shuttle allows students to travel around central campus quickly and efficiently. Also, this bus travels to the Oxford dormatories. For information about transportation between Ann Arbor, Detroit Metro Airport, and East Lansing, please visit the Michigan Flyer Website. Interested in traveling to the Detroit Metro Airport (DTW)? Check out a shuttle service offered by the AATA called AirRide. Need to get to the airport during a school break? There is a service provided by Central Student Government, AirBus, available to students for a small fee. The Detroit Connector provides transportation between Ann Arbor and Detroit in support of curricular, research, and community service opportunities.